"My Friends Hate Their Cell Phones... I love my Jitterbug!" The new Jitterbug Flip cell phone makes staying in touch a pleasure again. It’s easy to see and hear, super-simple to use plus it’s surprisingly affordable. A simple cell phone made for seniors that grew up when phones were connected by wires. The Jitterbug Flip cell phone is designed to be a simple cell phone for seniors, not some sort of alien technology that you need to decipher in order to use it. When you’re ready to dial, you can flip open the cover and use the large, easy-to-see keys or simply tell your phone who to call. You’ll hear a familiar dial tone that tells you that it’s ready for you to make a call. Its voice dialing capabilities will connect you with the right person. Even the advanced features are easy to use if you choose to take advantage of them. Menus use simple Yes or No buttons instead of some cryptic icons. And, if you need help, friendly USA-based operators can be reached simply by dialing "0" anytime...day or night. Finally, you’ll love the additional features on the new Jitterbug Flip. Snap and share photos with the built-in camera or use the new flashlight with integrated magnifier to see in dimly-lit areas. This phone is truly designed to put the features that you need most at your fingertips when you need them. 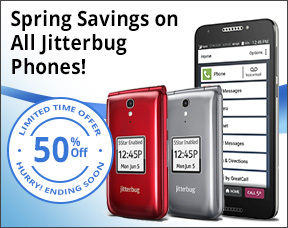 Your new Jitterbug Flip cell phone makes phone calls easier... even when you are on the go. What good is a cell phone if you cannot see or hear it well enough to use it? You won’t have to worry about that with the Jitterbug Flip. The numbers on its bright, high contrast color screen are big and incredibly easy to see. Day or night, you’ll have no trouble reading and pressing the backlit dialing keys labeled with big, legible numbers. Jitterbug also helps you hear whoever you’re trying to connect with. It features an amplified speaker which makes calls louder and a built-in speakerphone for hands-free listening and talking. It even holds the highest available rating for compatibility with hearing aids (M4/T4). Affordable cell phone plans for everyone. You may have heard the horror stories of cell phone bills totaling hundreds of dollars in a month’s time. With Jitterbug, great care has been taken to make sure that this is not only a simple cell phone...but an incredibly affordable one. Talk and Text Plans as low as $14.99 per month plus taxes. Talk and Text Plans are perfect for emergency use and occasional calling and still include a bundle of services at no extra charge. Need more minutes? We have plans for "frequent talkers" that are a great deal, too. Call Now for your FREE Car Charger - a $25 value! Copyright 2019 - firstSTREET for Boomers and Beyond, Inc.
* Great Call Inc. will ship your phone to you within two weeks. The phone will come to you with your account already set up and is easy to activate. After your payment, and after your phone has shipped, Great Call will charge you for your first month of service plus all applicable taxes. All subsequent monthly payments will be charged by Great Call, Inc. to the credit card on file each month. Subject to Customer Agreement, select calling plans and credit approval. Other charges and restrictions may apply. Screen images simulated. Monthly fees do not include government taxes or assessment surcharges and are subject to change. Coverage is not available everywhere. 5Star or 9-1-1 calls can only be made when cellular service is available. 5Star Service will be able to track an approximate location when your device is turned on, but we cannot guarantee an exact location. Jitterbug, GreatCall and 5Star are registered trademarks of GreatCall, Inc. Copyright ©2019 GreatCall, Inc.